A man flashes a smile in satisfaction and celebration that he has done his civic duty before he was arrested during a sit down protest outside the Wanstonia eviction during the No M11 Link Road protest. 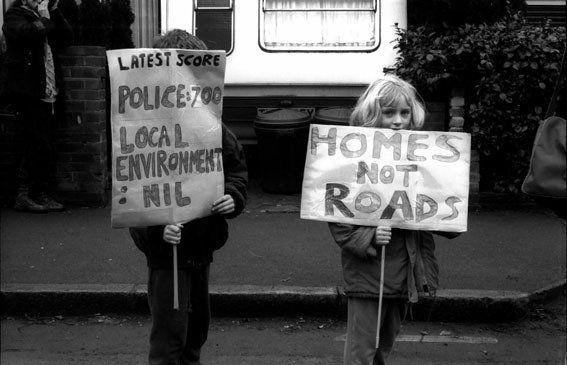 Two small children hold placards saying Latest Score Police 700 Local Environment Nil and Homes Not Roads during the Wanstonia eviction that took place on the 16 Feb 94 as part of the ongoing resistance to the building of the M11 link road through Leyton and Wanstead in East London during the No M11 Link Road protest that took place from January to December in 1994. A riot policeman forces the arm of a girl clinging to a beam in a roof space of an occupied home far up behind her back in order to inflict enough pain to make her let go so he can arrest her during the Wanstonia eviction. 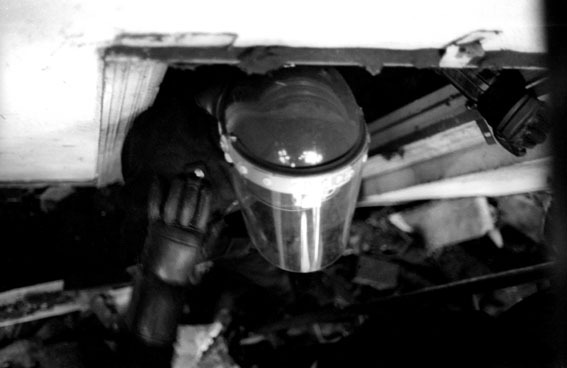 A riot policeman enters a room below a gap in a ceiling of a home occupied above him as one of his colleagues reaches out to cover his shoulder number from the gaze of the camera during the Wanstonia eviction during the No M11 Link Road protest. A bailiff called Brian who was stranded on the roof by his colleagues of a building occupied by people he was trying to remove during the Wanstonia eviction during the No M11 Link Road protest. A local man called Mick occupies the top of a chimney while another man who has occupied the roof of another house looks on during the Wanstonia eviction during the No M11 Link Road protest. 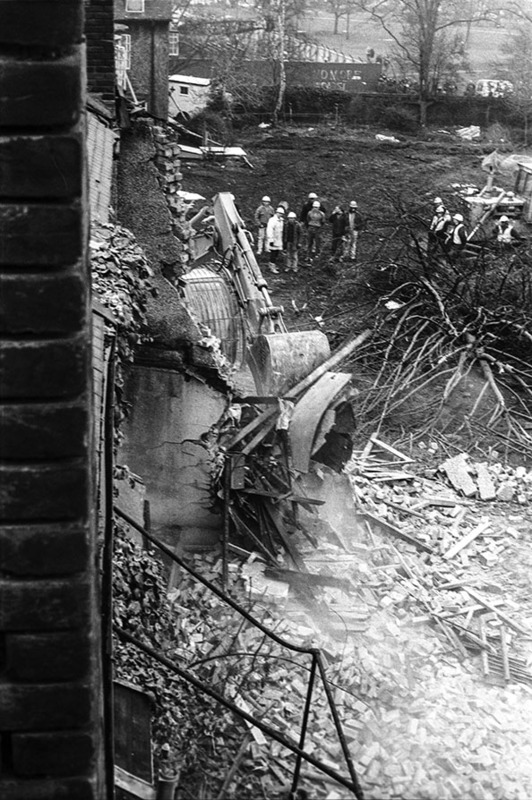 A cloud of dust erupts as a digger begins to demolish homes occupied by people who were inside and on top of them making the building shake and tremble during the Wanstonia eviction during the No M11 Link Road protest. A group of riot police assembled to break into homes occupied during the Wanstonia eviction during the No M11 Link Road protest. A large toy car lashed to a chimney on the roof a home oocupied by people looking at police and bailiff activity on the ground during the Wanstonia during the No M11 Link Road protest. A person banging a drum stood on top of a chimney stack during the Wanstonia eviction t during the No M11 Link Road protest.